Studio Line: Warner Bros. - The Deeper You Look. The More You Will Find. Their hearts were sealed. Their love was the key that opened them. The life-altering power of romance works its magic on a driven, street-hardened policewoman (Jennifer Lopez) and a mysterious drifter (Jim Caviezel) who saves her life during a shootout. Box Office: Budget: $38 million. Opening Weekend: $9.225 million (2375 million). Domestic Gross: $24.044 million. DVD: Widescreen 1.85:1/16x9; audio English Dolby Digital 5.1, French Dolby Digital 5.1; subtitles English, French, Spanish; closed-captioned; single sided - single layered; 29 chapters; rated R; 103 min. ; $24.98; 10/16/01. Supplements: Audio Commentary With Director Luis Mandoki; Cast and Filmmakers. Many actors have launched singing careers - and vice versa - but exceedingly few became more successful at their new endeavors. Off the top of my head, I can think of Rick Springfield as the only actor who became better known as a singer. However, he’s probably a bad example; he started as a musician and then went into acting, where his popularity allowed him to pursue music. Right now, Jennifer Lopez is likely equally well known as both a singer and an actress, though she’s done the latter for a much longer period of time. However, her string of musical hits and her inability to score at the box office may change that balance soon. Clunkers like 2001’s Angels Eyes do nothing to further her name as a thespian. Somebody must have thought Eyes had a chance to be a hit, for it received a prime mid-May release date. However, the modestly budgeted film pretty much tanked, as it scored only $24 million in the US. That figure didn’t even match the relatively cheap $38 cost to make the thing. Based on the little I knew about Angel Eyes, I thought it would offer some sort of supernatural thriller. After all, those are quite prevalent in this post-Sixth Sense era, and although I don’t remember the film’s trailer well, it left me with that sort of impression. Such an idea could not be farther from the truth, though I didn’t fully realize this until well into the movie; the structure of Angel Eyes allowed me to believe my mistaken concept for quite some time. The movie follows police officer Sharon Pogue (Lopez). As it begins, we see her rescue the victim of a car wreck, but the movie quickly moves ahead to her daily life. We see her somewhat strained relationships with coworkers and family; apparently her dad (Victor Argo) used to abuse her mom (Sonia Braga), and Sharon remains distanced from the family. Matters complicate because it looks like her brother Larry (Jeremy Sisto) is repeating the same pattern with his own wife Kathy (Monet Mazur) and son (Daniel Magder). Reasonably early in the film, some gangbangers come after Sharon and her fellow police officers, and a chase ensues. One almost nails her but a mysterious stranger named Catch (Jim Caviezel) saves her. An odd romance follows upon this, and we slowly start to learn a little about this oddball and his sparse life. I’ll end my synopsis there in the interest of avoiding any potential spoilers. However, I want to note that absolutely nothing about the film surprised me. Actually, some of it did catch me off-guard just because I kept waiting for some spooky twist to occur; my mistaken impression of the flick led me to anticipate something that never came. Oh, Eyes had some mild turns, but I felt none of these seemed even remotely surprising. As such, Eyes lives and dies as both a family drama and a romance. For the most part, it died. This was simply a very thin piece that felt more like a TV movie than a full feature film. I found the characters to be flat and lifeless, and virtually nothing about the tale involved me. I won’t say that it was a painful experience to watch, but I never developed an interest in any part of the flick. Technically, Angel Eyes wasn’t a bad piece of work, but it seemed to be relentlessly dull. I can’t pick out any particularly poor scenes, but I also can’t spotlight anything that I liked about it. The movie passed reasonably painlessly but never involved me or brought me under its spell. This was a totally ordinary and unimpressive piece of work. 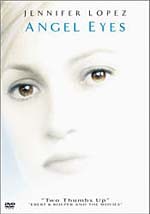 Angel Eyes appears in an aspect ratio of approximately 1.85:1 on this single-sided, single-layered DVD; the image has been enhanced for 16X9 televisions. DVDs from Warner Bros. have almost reached the stage of “money in the bank”; their picture transfers have been uniformly excellent recently, and nothing I saw during Angel Eyes altered that impression. Sharpness seemed to be very strong. At all times, the movie remained crisp and detailed. I saw no signs of softness or fuzziness, as the film consistently came across as distinct and accurate. I witnessed no examples of moiré effects or jagged edges, and I also detected no edge enhancement. Print flaws caused some very minor concerns. I witnessed a speck or two and a few small marks, but otherwise this was a clean and fresh image. Colors looked consistently clear and solid. Eyes didn’t offer a tremendously vibrant palette, but its hues seemed to be clean and satisfying throughout the movie. I saw no problems related to noise, bleeding, or other concerns, and the colors stayed very positive at all times. Black levels also seemed to be deep and rich, while shadow detail was appropriately heavy but not excessively thick. Ultimately, Angel Eyes offered a fine visual experience. The Dolby Digital 5.1 soundtrack of Angel Eyes also seemed to be fairly satisfying. The soundfield provided a nicely active and engaging piece. The forward spectrum showed good stereo separation to the music and localized other elements accurately and cleanly. Objects moved neatly across channels, and the surrounds added a nice layer of reinforcement. When appropriate, elements cropped up uniquely in the rears, and the film featured a good layer of general reinforcement across the board. The soundfield wasn’t a stellar affair, but it nicely complemented the film. Audio quality also seemed to be generally positive, but it appeared a little flat at times. Dialogue sounded consistently natural and distinct, and I heard no concerns related to edginess or intelligibility. Effects were crisp and clear, but they lacked a great deal of power. At times they came across with fine depth, such as when we heard loud rap music from a vehicle, but overall I felt the range seemed a little lacking in low-end. The same concerns affected the score. Music showed good clarity but it failed to provide the desired level of bass. Overall, these concerns were fairly minor, however, and I thought the mix was good enough to earn a “B+”. Angel Eyes includes only one major supplement. In addition to Cast and Crew filmographies for Jennifer Lopez, Jim Caviezel, Sonia Braga, Victor Argo and director Luis Mandoki, we get an audio commentary from Mandoki. This running, screen-specific affair was one of the most erratic tracks I’ve ever heard. On the negative side, the commentary suffered from some huge gaps at times. Mandoki would vanish for minutes at a time, and this made it tough to sit through the piece. He also tended toward too much happy talk, with quite a lot of praise for the participants. However, at least Mandoki backed up that attitude with data; rather than just tell us how great everyone was, he stated why he thought they were so good. This meant some fairly interesting stories about work on the set, from cinematographic techniques to working with the actors to get the desired results. Mandoki seemed a bit stiff most of the time, but he included some good anecdotes, especially during the brief moments when he talked about Sonia Braga. Ultimately, Mandoki added enough interesting material to make the commentary worth a listen, but it remained rough at times. As an aside, Mandoki provided one unusual viewpoint I wanted to mention. Those afraid of spoilers should immediately skip to the next paragraph! Mandoki seemed to view “fate” as part of the film’s theme, since he apparently felt our two leads were destined to meet. Oddly, he presented this from the point of view that their connection was worth all they went through to get there, even though Catch’s wife and child died in a car crash! Man, I must have misinterpreted this - the guy didn’t really say that the love affair between Catch and Sharon merited the death of two people, did he? It sounded that way to me. While Angel Eyes wasn’t the worst film I ever saw, I have little positive to say about it. It was a relentlessly mediocre piece that never threatened to interest or entertain me; it plodded along to a bland conclusion and didn’t involve me at all. The DVD provided very solid picture and good sound plus an erratic but decent audio commentary. Ultimately, the package was decent but Angel Eyes offered an uninspiring experience.